Ideal for commercial environments such as restaurants, cafeterias and bars where there is a risk of contamination, but above all for occasional locations such as food trucks, catering for parties and ceremonies, fairs, demonstrations, and pizzerias wanting to serve Gluten-Free Pizzas. 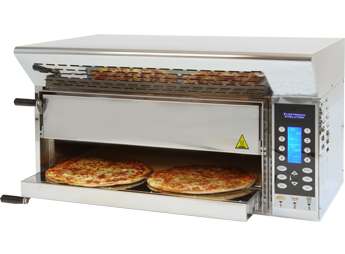 The new range of Electric Pizza Ovens has the best technology that is applied to pizza ovens. The Voglia di Pizza XL oven is predominantly for the American market and makes it possible to cook 4 pizzas in just 2 minutes and in only 35 inches of space. Soft and delicious pizzas cooked quickly and uniformly. Electronic temperature and time control, interactive chart, counter fot the number of pizzas baked in order to monitor productivity. Thanks to the use of refractory stone and through the sophisticated electronic management system, exceptional cooking results are ensured. The final product is practically identical to those obtained with traditional baking methods. Thanks to its small size and low consumption, the Voglia di Pizza XL Oven is ideal for both gluten-free pizza baking using dough, precooked and frozen pizzas, ensuring that there is no gluten contamination from other ovens used improperly. The Voglia di Pizza XL Oven can also maintain high heat within its chambers, thus guaranteeing the highest quality final product. The XL Oven has a maximum power consumption of 20 amp and a standby consumption of 7 amp. The Voglia di Pizza XL Oven, along with our entire range of pizza ovens, is a very high-performance oven (840 °F maximum temperature) and is also equipped with an activated carbon aspiration hood that eliminates fumes and any other bad odors. Thanks to the use of incoloy resistances and infrared emission, a pizza oven without flue can cook up to 4 pizzas simultaneously in a very quick time. Thanks to our revolutionary baking system controlled by a latest-generation microprocessor, as well as the burner's isolation system and the use of the refractory stone specially designed for our pizza ovens, we can ensure exceptional cooking results with very low energy consumption. With this oven it is possible to obtain a baked pizza that is practically identical to those baked in wood-burning oven. Pizza ovens reach a maximum temperature of 840 °F and this is why great attention was dedicated to the choice of stainless steel. Indeed, over time the oven's high temperature can hurt the consistency of normal steel used by the vast majority of ovens on the market. Instead, our steel and the structure of our burners is designed to allow great reliability over time, ensuring the same temperature isolation from the first day of use.